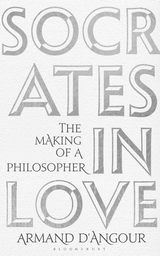 In March 2019 Bloomsbury published my book Socrates in Love: The Making of a Philosopher. Using ancient written sources that have been generally overlooked or misinterpreted, I recover a lost picture of Socrates as a young man in his teens and 20s. Since he was already known as a philosopher in his 30s, this earlier period is where we need to look for evidence of his change of direction to becoming the thinker he was to be. My new interpretation of the evidence firmly identifies Socrates’ alleged instructor ‘Diotima’ in Plato’s Symposium with Aspasia of Miletus, the brilliant partner of Athens’ dominant political figure, Pericles. I conclude that important elements of Socrates’ thinking resulted from his acquaintance with and admiration of Aspasia, who was close in age to him, when he was in his 20s. If Socrates changed direction, what was his direction before? As a boy he was a pupil in dance and music of the famous teacher Lampros, who had also taught Sophocles (who was 25 years older than Socrates). As a teenager he studied the ideas of earlier (‘Presocratic’) thinkers such as Anaxagoras, who was close to Pericles; and he became the intimate protégé of another important thinker, Archelaus. Socrates grew up, therefore, in an upper-class milieu, in which young Athenian men valued intellectual and musical achievements as well as physical prowess and courage on the battlefield. This picture will surprise those who imagine that Socrates was poor and of lowly background. In later life his appearance was notably unrefined, and he went around barefoot and in ragged garments; but he is made to say (in Plato’s Apology) that he chose poverty in order to pursue his calling. The earliest visual description of Socrates is in Aristophanes’ play Clouds of 423 BC, when he was 46. There he is depicted not as ugly or paunchy — by his own admission he put on weight after his fighting days were over in his 50s — but as one of a group of pale, scrawny, and long-haired thinkers. The fact that Socrates is portrayed by Plato and Xenophon as a man of high education, knowledge, and intellectual authority compels the conclusion that he was well schooled from youth, and not the uneducated child of an impecunious father. A regular fighter in Athens’ battles until his late 40s, he must also have possessed the wealth qualification and expensive panoply (suit of armour), as well as the courage, physique, and fitness, to be a hoplite soldier (heavy-armed infantryman) from the age of 20, when Athenian hoplites were first deployed on the battlefield. Socrates’ father Sophroniscus was a stonemason, but that may mean a well-off artisan, perhaps even the owner of a workshop with numerous slaves, at a time when Athens was commissioning a huge number of stone monuments after the Persian Wars. Sophroniscus had high-class connections in his native village: his closest friend there was known to be Lysimachus, son of the war-hero Aristides and a man of impeccably elite status. Socrates’ first marriage was to Lysimachus’s daughter Myrto, with whom he had his two older sons. This marriage will have taken place long before he encountered his later companion, the famously demanding Xanthippe, in his 50s. Young Socrates grew up, then, among young men trained in poetry, music, oratory, philosophy, dancing, wrestling, and fighting. He too would have wanted to compete and excel in those spheres. What impelled him to turn to the life of the mind, shun material success, and reorient philosophical thinking for posterity? The facts recounted above about Socrates’ life are readily available to historians, even if their cumulative implications have not been given due weight. What has hitherto gone unrecognized is that, when Socrates says in Plato’s Symposium that “long ago [i.e. as a young man] I learned all about love from a clever woman”, we are being told a biographical truth. The woman is given the name ‘Diotima’, and she has long been supposed a fictional character. But renewed scrutiny of the text of Symposium and of relevant historical evidence points to ‘Diotima’ being Plato’s disguise for a real woman: Aspasia of Miletus. The partner of Athens’ leading citizen Pericles for more than a decade, Aspasia was the cleverest, best known, most influential, and most reviled woman of her day. Part of Pericles’ circle of thinkers, artists, and politicians, she was known as being an expert instructor of eloquence and a sought-after adviser on marital relationships; in other words, someone who was known for presenting a doctrine about Love, just as Diotima is portrayed in Symposium. In another of Plato’s dialogues, Menexenus, Aspasia herself is described training Socrates to give a speech. The notions attributed in Symposium to ‘Diotima’ are central to the philosophy as well as to the way of life that Socrates was to espouse: that the physical realm can and should be put aside in favour of higher ideals; that the education of the soul, not the gratification of the body, is love’s paramount duty; that we need to define our terms before we can hope to know what they entail in practice; and that the particular should be subordinated to the general, the transient to the permanent, and the worldly to the ideal. Her thinking, no less than what Socrates and his successors were to make of it, should therefore be acknowledged as lying at the very root of the Western philosophical tradition. Unravelling the identity of ‘Diotima’ makes for a historically momentous conclusion. In retrospect, however, the identification is so obvious that its failure to be seen clearly up to now can only be attributed to conscious or unconscious prejudices about the status and intellectual capacities of women throughout the ages. The time has come to restore Aspasia to her true status as the woman who, through her contribution to Socrates’ thought and therefore that of his successors, may now be recognised as key to the two-millennia old legacy of Western philosophy.